Happily nestled between Italy and Slovenia, jutting into the the Adriatic Sea, Croatia’s peninsula of Istria has some impressive neighbours to compete with in the tourism stakes. But with the region’s rich cache of truffles, vineyards and farmlands supplying some of the most notable culinary experiences in the country, and with natural beauty worth wowing over, Istria is quickly becoming a not-to-miss region of Croatia. Here are four quiet delights that I relished during my recent adventures in Istria. The port city of Pula (or Pola in Croatian and Polensium is ancient times) is on western coast of the peninsular and is the largest town in Istria. Known as being a bit of a party town and full of European holiday-makers, Pula hosts a buzzing historical centre scattered with ancient structures and a laid-back residential sprawl. It is also the home of a remarkably intact ancient Roman amphitheatre which sits quietly (with exception of concert nights) on the portside edge of the city centre. Although not as famous as the Colosseum in Rome, I found Pula’s Augustan amphitheatre to be comparably impressive. It is the sixth largest ancient amphitheatre in the world, with a capacity of more than 20,000 people and has all sides still standing. It is also delightfully uncrowded, meaning you can admire the ancient stone arches in peace, without the queues, expenses and shuffling associated with other ancient amphitheatres. 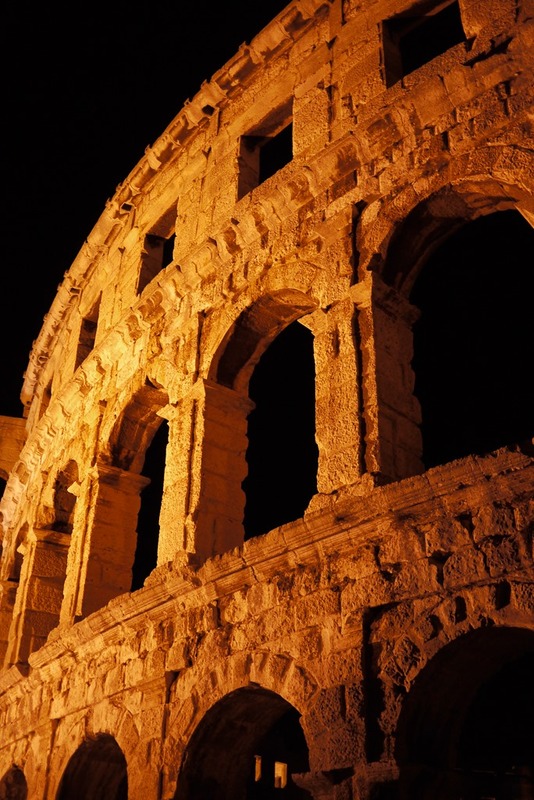 The ancient structure serves as Pula’s star event venue and in the summer months of July and August, the amphitheatre regularly hosts evening performances as part of the the Summer Festival. 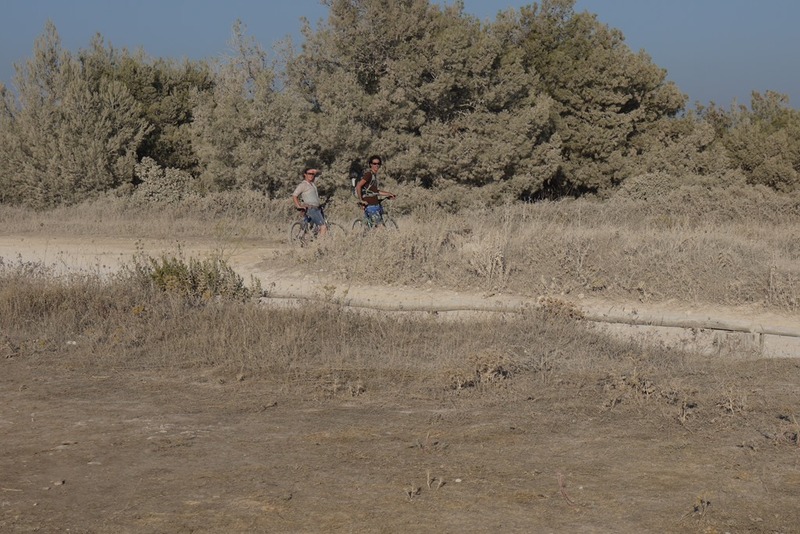 While the historical centre of Pula is pretty and populated with tourist-friendly shops, restaurants and tourism operators, it only needs a night or two of exploration at the most, and is best used as a base to explore the nearby beaches and farmland. Pula travel tips: Walking around the historical centre of Pula is quite easy, but if you want to venture further, I suggest a taking a bus or a taxi. Main bus routes leave from either the bus station, which is a little out of the centre of town, or Giardini, near McDonalds in the city. Tickets cost 15 Kunas for a single trip. A Taxi Cammeo is another cheap and easy option. I was reliably informed by our local host that only the company called Cammeo charges super cheap rates (15 Kunas for first 3km, then 6 Kunas per additional Kilometre) and can be called 24 hours every day on (country code +385) 060700700 or 052885885. If asking a hotel or restaurant to call a cab for you, mention Cammeo and they will know what you’re talking about. For regional and international travel, look at intercity buses that leave from the bus station and trains connecting Pula to other towns in Istria and with Slovenia’s capital, Ljubljana. There are also ferries from the main city port that travel to some of the Croatian islands, Zadar and Trieste, near Venice in Italy. Make sure you book your ferry ticket the day before you leave from one of the tourism agencies in the centre of town, as you can only buy tickets for boat tours from the port and on the day of departure (and even then, they may insist of buying a day in advance). Best known as the gateway to the Brijuni Islands Nature Park, the sleepy vilage of Fažana, is also a surprisingly delightful spot for enjoying the sunny coast of Istria. There, by the shimmering turquoise sea, I embraced the joys of patient Croatian sunshine, reading trashy novels in a beach lounge and sipping sweet cider from 10am onwards. The village proudly offers a strip of restaurants by the marina, a small local market selling crafts, soaps and pickled things, and pretty coastal landscapes that please the wandering eye. Tips for travelling Fažana: From Pula, the 21A bus from stop 9 on Giardini in the city centre takes about 15 minutes and costs 15 Kunas one-way. If you’re interested in taking a ferry to Brijuni Islands, weave through the quiet village streets towards the ferry pier, where you will find a tourism office selling transfers to the islands for 210 Kunas. The islands can only be visited as part of an organised tour, which includes a little tourist train and safari park access. Radiating from the ferry pier and marina, you will find a seaside boulevard lined with restaurants and cafes open all day for your culinary enjoyment. It is a lazy kind of dining area offering lovely views of the sea. Past the restaurants, there is a long pebbled beach scattered with umbrellas, beach lounges and bars where you can enjoy a shamelessly lazy day in the sun. We paid 30 Kunas to use a ‘deluxe’ lounge (with cushions, an umbrella and side tables) for the day. There is also a waterpark for the kids at 60 Kunas per hour and bike hire from travel agencies in town for 55 Kunas per day. A camping ground sits by the water at the end of the beach strip and was busier than the village centre when I visited in summer. There is no doubt that the mighty queen of Istrian cuisine is the black truffle. Since its discovery in the fruitful soil of the Motovun Forest about 80 years ago, Istria has benefited from the fragrant delights and international demands inspired by this odd-looking delicacy. A happy consequence of dining in Istria is ordering a truffle-covered dish for a fraction of what you would pay almost anywhere else in the world. To add extra happiness to your truffle adventure, be sure to try some wine from the Pula region, such a red Teran or white Malvasia, which are generally agreed to be among the best quality wines in Croatia. Tips for dining in Istria: The best truffles I ate during my visit were in a traditional restaurant on the outskirts of Pula called Konaba Kazun. Located in a modest, house-like building on Vitasoviceva (on a main road near the Lidl supermarket), this restaurant was clearly a local favourite and served amazing first plates that were laced with truffle goodness. 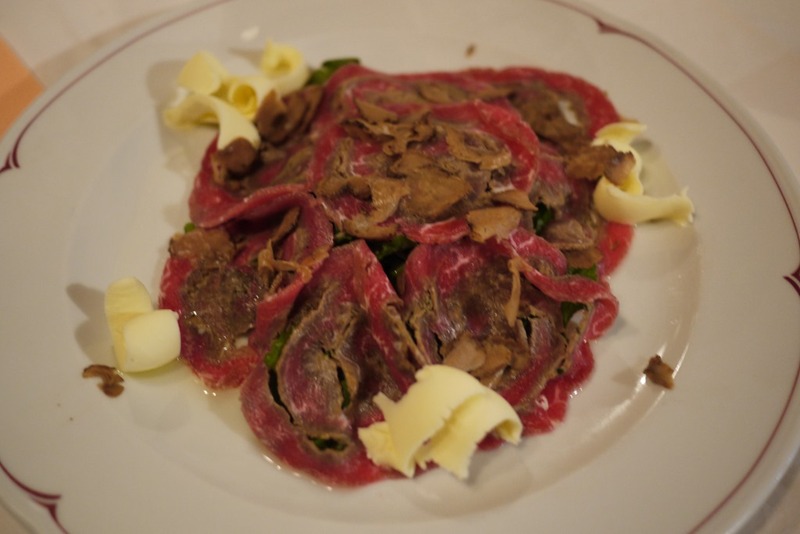 Unless you’re particularly keen on the large slabs of meat with potato, I would suggest skipping the main plates and focusing all your attention on the traditional first plates, such as beef carpaccio with truffles, fuži (hand-rolled pasta) with ragu, and green pasta with truffles. Also, be sure to book ahead or be prepared to wait for a table (although there is not much else around to help you occupy waiting time). Thick white dust coats pine fronds like snow and butterflies dance in dizzying spirals within the eerily beautiful Kamenjak nature park near Pula. 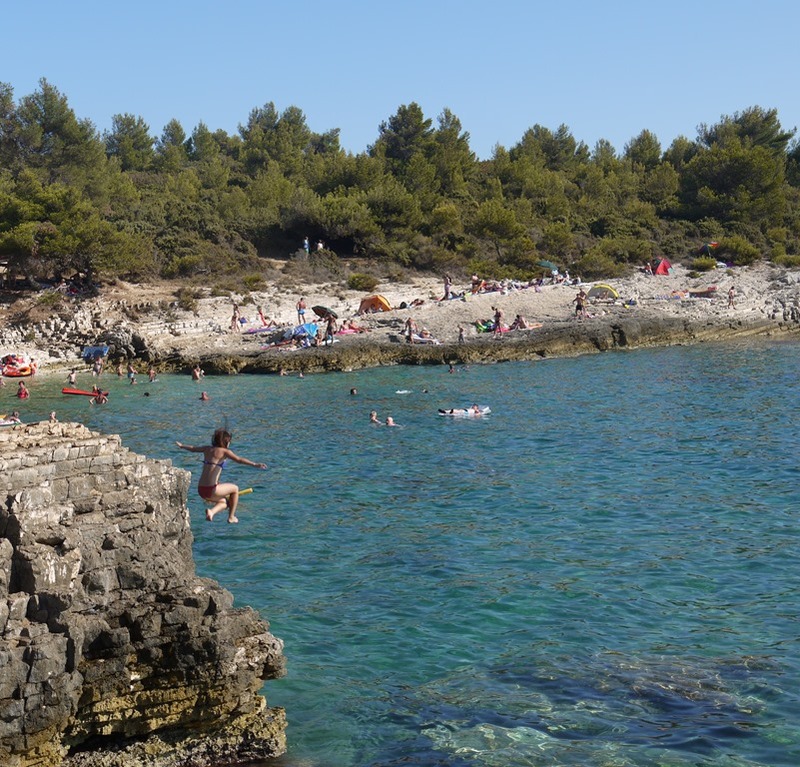 Recommended to us by our local hosts, our day trip to Kamenjak was the highlight of our adventures in Istria, mostly due to the incredibly clear, enticing sea that sparkles beneath the rocky coastal cliffs. Riding along the unsealed roads from Premantura to the tip of Kamenjak was a dusty 3.4km journey that took about an hour and that may be described as a ‘mountain biking for beginners’. We joined the the summer-loving locals under shrubby cliff-top shade and stayed for hours longer than planned, just to enjoy the blissful seaside. Tips for travelling to Kamenjak: Bus 28 from the Pula bus station or Giardini in the town centre will take you weaving through villages for 45 minutes and drop you at Premantura, near the entrance of the nature park. A single fare will cost you 15 Kunas, and if you are keen to cycle your way along the long nature park, bike hire for the day will cost you between 60 and 80 Kunas (seemingly depending on who is behind one of the bike hire counters in town). If you arrive after 2pm, try your luck at hiring a bike for only 50 Kunas. Park entry is free for bicycles and pedestrians and costs 20 Kunas for motorbikes, 35 Kunas for cars. You can pick up a free map from the hut by the entrance. 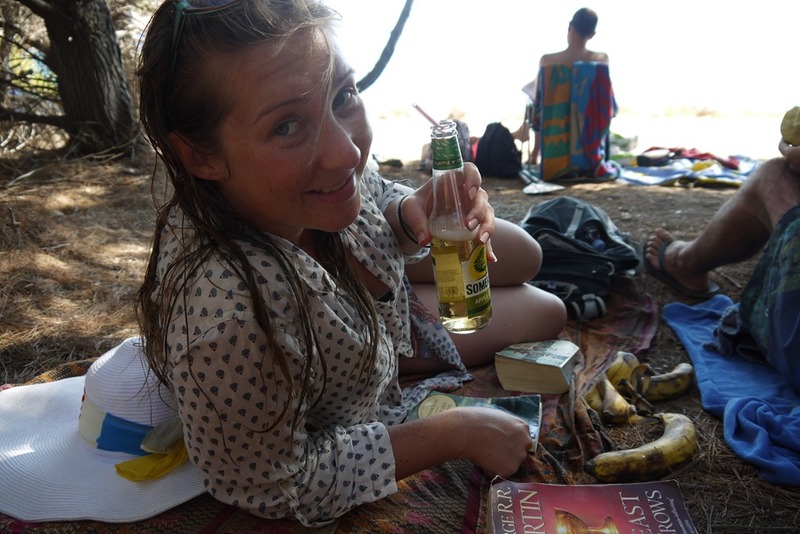 There are a couple of beach bars at various swimming points in Kamenjak (as signed on the road) selling ćevapčići with bread, hamburgers, beer and cider but taking your own water and snacks is recommended as the bars tend to run out of essentials towards the end of the day. Thanks Patti! Makes me happy to think I’m sharing the travel knowledge I’ve gained this year. There is always so much to learn. All year I’ve had tabs open translating, converting, mapping, searching… it’s so much fun. 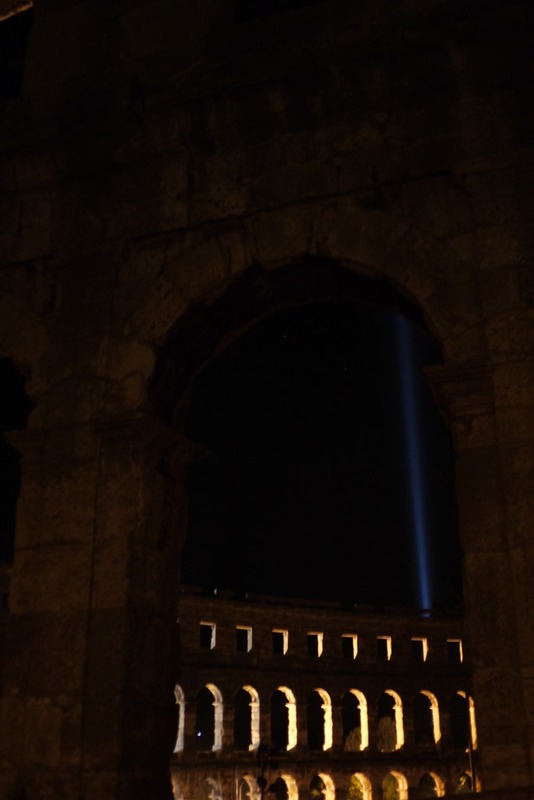 I agree – Pula’s arena is probably better than Rome’s. Elton John was playing a gig there the night I left, fortunately! Thanks ABoC. Yes I was just blown away by the amphitheater. Our apartment was directly opposite so we saw the ancient arches every morning from the window. There was a concert the night before we arrived (a Croatia star who I’d not heard of) and the stage pack up was taking place the whole time we were in town. Such a cool place for a gig, especially something like Elton John – how epic! Nice to see some less obvious Croatian places. I’d wondered about Pula and the amphitheatre but had decided I’d stay at Rovinj and just pop over for a look. I’m sure Rovinj will be seriously touristy but it looks so pretty. 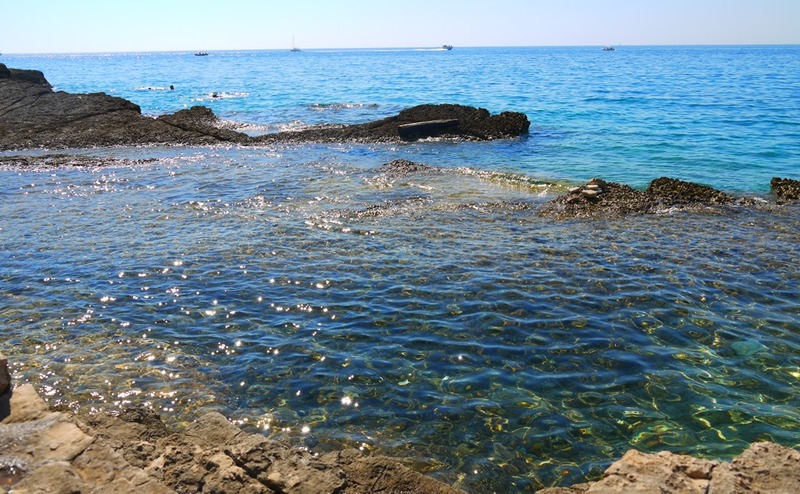 I have heard very lovely things about Rovinj as well – it is meant to be very pretty – and I’m a little disappointed we didn’t make it there as well. 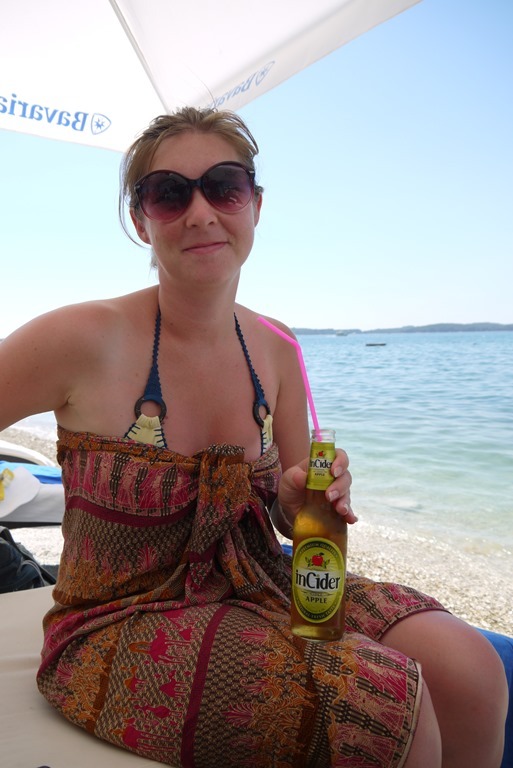 Have more ‘less obvious’ Croatia travel posts coming up Jo, so stay tuned! I am becoming more and more envious of your life as I continue to read your blog!! One of these days, I too will travel the world, and soak up every minute of it’s wonderfulness…but for now, I live vicariously through you! I don’t know if I told you in the first comment I left you, and you prob. don’t even remember me…but I’m an ACF certified Chef, for 16 years now. So, when you write about your delicious culinary discoveries, it’s extra perk to my interest. You know where I’m going with this… Yes!! Truffles!! I can close my eyes and smell them, almost taste them because my endless love for them, it was love at first taste, brings me to the mental euphoria that I experience when I have truffles right in front of me!! The carpaccio with truffles looked dynamite!! Also, I learned a little bit about truffles as well. I was under the impression that they were first discovered in France. Now I know. Thank you for that. As always, thank you for sharing!! Of course I remember you. Thanks for reading along. Yes, the truffles were just so amazing… richer with the volume and a fragrant addition to a meal that I could never get sick of. I’m sure you know what I mean. Keep an eye out for the next foody posts about Croatia – there will be more than one as it was my favourite country for eating! Nic – Yes, indeed, I know exactly what you mean (in reference to the volume and fragrance of truffles…and never getting sick of them…oh no!!) Looking forward to your food posts from Croatia!! Thanks for the reply!! 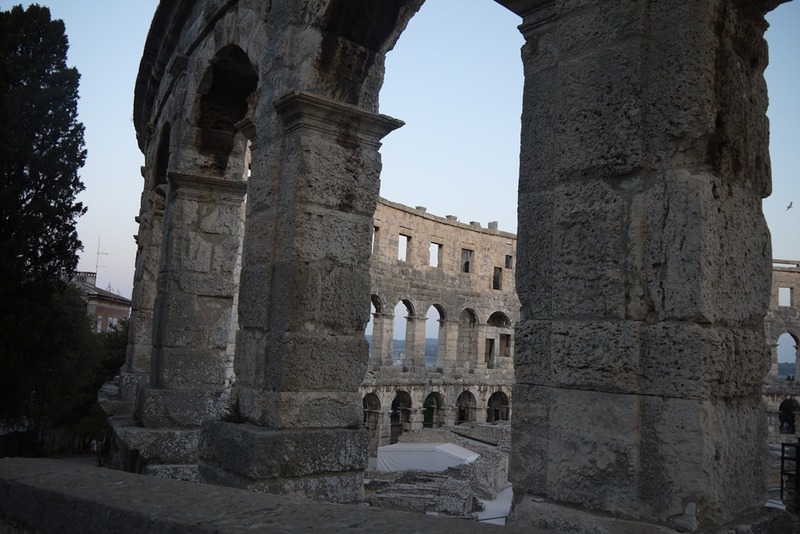 The amphitheatre in Pula is one of my favourites. Spent a few days in Fazana and loved it – thanks for the memories. As always, thanks for reading Andrew. Fazana was one of those places that I was delighted to discover and simultaneously sad that I didn’t know about beforehand to plan a longer stay. And the Pula amphitheater, wow, what a lovely surprise.